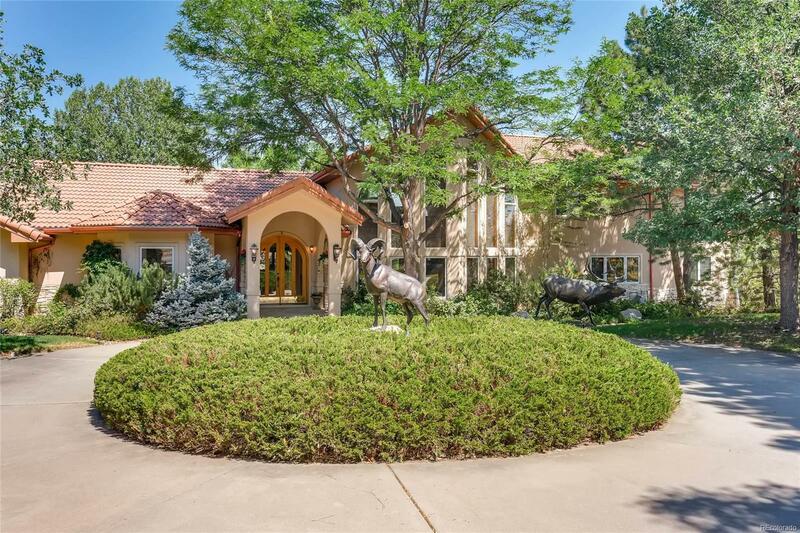 Beautiful "one of a kind" home located on 2+ secluded acres less than 6 miles from the DTC. 7528 finished SF with an additional large custom built out-building providing indoor parking for all of your favorite recreation vehicles & more. 2 stall horse area w/ tack room, water, electric, exercise ring, fenced pasture surrounded by 150+ mature trees. Wonderful kitchen w/ top grade appliances, built in Sub Zero ref, gas top cooking, large center island, service counter adjacent to large formal dining room. Main kitchen opens to a 2nd full service outdoor kitchen on the spacious trex deck. Main floor great room offers 20' cathedral ceilings w/ a sweeping staircase leading to the master suite & a large loft area which overlooks the greatrm area. Master suite has jet tub, skylight, 2 large walk in closets & a balcony with views. On walkout level, huge familyrm very similar to upper greatrm, more bedrooms, workout room, shop area. NOW BOM with ALL NEW ANDERSEN WINDOWS AND EXTERIOR STUCCO!